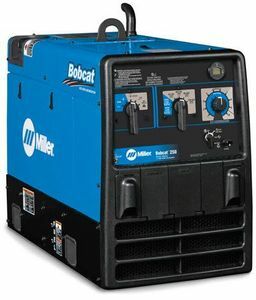 The Miller® Bobcat® 250 welder with GFCI features 120 volt duplex receptacles with Ground Fault Circuit Interruption protection. It is a 250 amp gasoline engine driven welder and 11,000 generator in one. The Bobcat® 250 is fuel efficient and very quiet. The smaller and lighter design means the Bobcat 250 is easier to transport and maintain. The electrical portion of the welder/generator is covered by Miller's True Blue™ 3 year warranty. 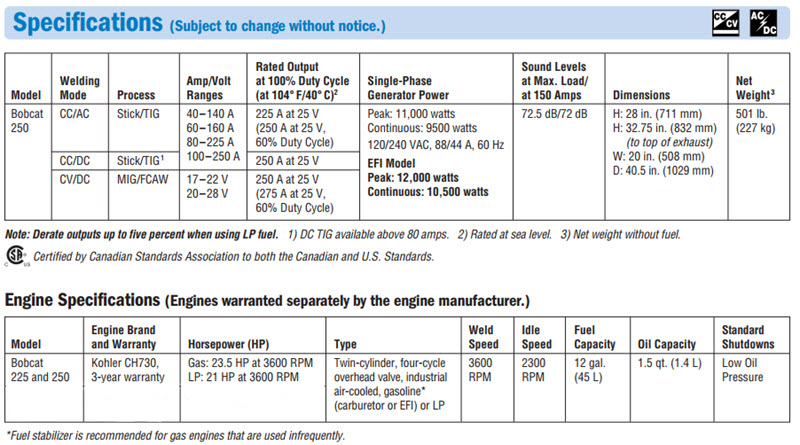 The Kohler twin cylinder, 23 Horse Power gasoline engine is covered by Kohler's 3 year limited warranty. GFCI (Ground Fault Circuit Interruption) protection on 120 volt duplex receptacles improves safety when using auxiliary power. For Bobcat® 250 LP and Trailblazer® 275 LP models 2012 & later - includes bracket and clamp to mount 33 and 43-pound propane tanks horizontally and hose with fittings.